i’m terrible at managing my time when on the computer. i always end up wasting time surfing the web when i should be studying or writing code. which is why i was really excited to hear about blossom today. 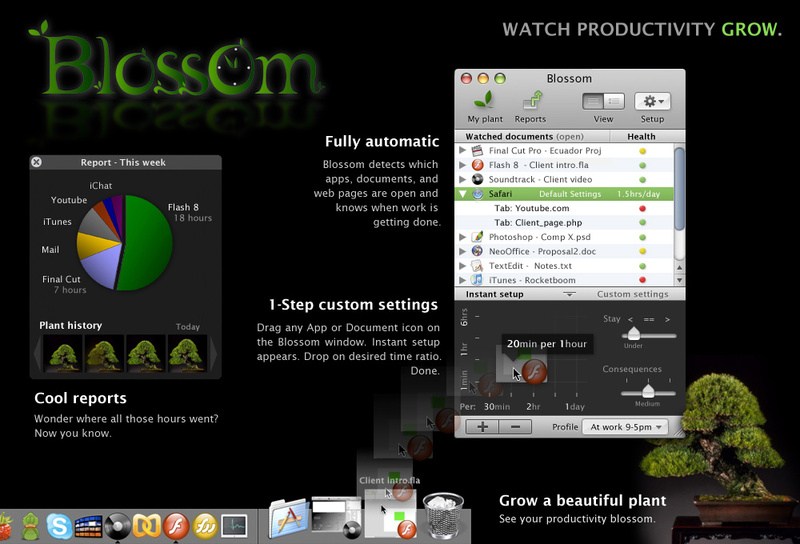 blossom is a suggested program for the mac, which’ll tell you how long you’ve spend on any one application; the idea is that if you see how much time you’re spending on youtube in relation to the time you actually spend doing work, you’ll feel guilty enough to actually do some work. needless to say, i was bummed out when i realized that blossom was still just an idea and hadn’t actually been coded up yet. since it’s a perl script that updates only once every 5 seconds, it takes up virtually no system resources and is quite fast. i wrote this thing in about 15 minutes – it’s terribly messy, feature-poor, and uncommented. nevertheless, it does do one important thing: it works. Indeed, this is very very useful! Thanks a lot for creating and sharing this!